These all timings given here based on the media sources and for convenience of the visitors to pre-plan their program. These timings may be changed, or modified time to time by the temple authorities due to the Festival days / Religion occasion / Holidays or any other occasion. Kindly re-check with the temple authorities for exact timings. I am extremely happy with the information provided by you. This is very useful as well as feeling comfortable to make our tour plan. I HAD WORST EXPERIENCE WITH THE TEMPLE AUTHORITIES ON 14.2.2010. THOUGH I PURCHASED ATI SEEGRADARSHAN TICKET OF RS.100 EACH I HAD TO COME BACK WITHOUT DARSHAN AFTER WAITING IN QUEUE FOR OVER 2.30 MINITUES.THERE IS NO MECHANISM OF ARRANGEMTNS FOR PROPER PASSAGE OF BHAKTAS. THE TEMPLE AUTHORITIES MOTIVE WAS ONLY TO EARN MONEY WITHOUT PROPER ARRANGEMENTS. @Ramachandra Garu, i can understand your feelings...since you came from very long for only swamy darshan... but you are unhappy with the arrangements... some times it is happening ..due to huge crowd at temple... and with the limited staff it is not possible to control all the things.. and also notable from 16 brahmotsav also starting .. may be the staff deployed for other duties.. i hope you understand the situation..
i am living in kukatpally. i want detailed route map for yadagirigutta from kukatpally.can anybody pls help. @Kumar / Ravi, best road way to yadagirigutta is NH202 HYD-Warangal Highway, you have to take it from Uppal X road. check the google maps by clicking "Route Map" link from top menu or from left menu on this blog. Plz Help me. Plz tell me the bus route and buses which pass through Yadagirigutta. ThanQ. if you are asking bus route from hyd, from Mahtma Gandhi Bus station / 6 No. / secunderabad Jublee Bus station / Tarnaka and from Uppal X road and Uppal you can find direct bus for yadagirigutta for every 15 minutes. Since Yadagirigutta having bus depo all the buses last stage itself yadagiriguta. bus route from Uppal x road is Uppal-Ghatkesar-Bibinagar-Bhongir-Raigir-Yadagirigutta. check the detailed 'Route Map' link from left menu on this page for more details. @Anon, Thanx for your compliment and comment which is giving me more inspiration. That is a detailed information on temple. Thank you. Do you have any idea whether we can perform thread ceremony at Yadagirigutta? @upparlapalli, thanx for the comment... as per the information i know, you can perform thread ceremony at yadagirigutta. check with pujaris there... they can guide you. Hi this is murali…..can any one tell….is there any bus facility or any other transport facility to reach the top of hill……bcoz i want this answer for old people who want to visit…..Thanks in advance friends…..good morning……. @Murali Krishna Garu, from Yadagirigutta bus stand every 15 min Devastanm bus is there for the uphill, moreover you can find hundreds of autos also from outside bus station to go uphill temple. I could not find any details regarding Kalyanm of Sri Narasimha swamy, as I want to book it online or atleast I should know the details. Thanx for the comment, i am not sure about the online booking of the Swamy Nitya Kalyanam, as per my knowledge its approx 1,116 rupees for kalyanam one time. you can directly purchase at temple office. keep visit this site i will try to post with full details. youmay check todays post for little info. Kindly intimate us the free darshanam timings and also request for special darshanam rates and timings. @syam only way to yadagirigutta from Hyderabad is Hyderabad-Yadagirigutta express way, which starts from Uppal X roads towards east (warangal Highway) if you are coming by vehicle come first to Uppal X Road and then drive on Warangal Highway. I wanted to know the Satyanarayana vratham timings. Shivakumar Goud gaaru, As i know the timings of vrathams are 7:30, 10:00, 12:00, 4:00, please reconfirm with temple authorities when you visit the temple. sir, i have to come from suchitra, trimulghiri, secunderabad. so i have to come from ECIl. the Road is clear to come on that way to ghatkesar road. please comment. @Naresh Kumar, if you want to come from ECIL cross road no need to go Ghatkeshar, from ECIL X road take strait towards keesaragutta and then Bommalaramaram, Thurkapally,Mallapur then yadagirigutta. upto Thurkapally it is in HMDA limit. the road is now doubled and filling stations also available, but from thurkapally to yadagirigutta its single road note please. Raghavendra Gaaru, as on today there is no online booking for Satyanarayana vratham, you can buy at temple premises only. First bus from MGBS is at 3.15 AM and last bus at 9.35 PM, in between you can find a bus at every 30 minutes. Dear Krishh.. as per available info there is no direct bus from Kondapur, you have to come to JBS or MGBS to take yadagirigutta bus. Hi This is sateesh. I am planning to visit yadagirigutta tomorrow. i am leaving near KPHB. Could you please advise me where i need to get the buses, MGBS or JBS or UPPAL. Hi, RTC buses are available from the Three locations which you mentioned. i suggested you to take from MGBS or JBS cose its a starting point for buses so you can get seats easily, nearest station is for you is JBS. Hai, i am Ram Charan Tej, i am planning to go to yadagirigutta temple, i am living in ameerpet, Hyderabad. Can you please tell me where i have to board the bus to plan my trip easily. Thanking you. How is the frequency of buses from MGBS and Secunderabad railway station? What are the bus numbers? Please provide details about return as well from Yadagirigutta temple after darshan to MGBS / Secunderabad railway station. Which is the best month to visit where we can see the GOD freely, I mean which time rush would be less. @Anon there is a bus for every 30 minutes from MGBS and also from JBS (Jublee Bustand, Sec bad). ther is no bus numbers. take "yadagirigutta" bus. no direct train to Yadagirigutta since there is no railway station. nearest rail station is Raigir. you can visit any day in the year but avoid the holidays, since there will be huge rush on that days... if you want to take freely darshan come on Tuesdays if it is not holiday. Hai, Ram Charan Tej... you may take buses from MGBS or JBS directly for Yadagiriutta... i think nearest for you is JBS.. I am planning to go to yadagirigutta temple on 15th of this month. i am living in madhapur. i just want to know,is this best time to visit? can you please tell me, so based on that i will plan my trip? Hi I am Vinod from Gachibowli Hyderabad. Our family want to do our relatives marriage in Yadagirigutta temple, could you please provide information regarding whom to approach and procedures to follow for conducting marriage. @Rakesh, your question little bit confusioned me... since temples never closed except Chandra Grahan and Surya Grahan... so I believe Temple remains open on sundays as usual. I'm planning to come to Yadagirigutta to visit the temple next weekend. I stay in Hyderabad. I'm planning to take MMTS local train till bhongir. Can you please provide information regarding how to reach the temple from bhongir railway station. goverment RTC buses will be available or not? if available, do they go near the temple? @Sunder, From Bhongir Railway staion RTC buses available towards yadagirigutta and also Sharing Autos avaialble. it will drop you at Yadagirigutta Bus stand from there you can take Sharing Auto or RTC bus for Uphill Temple. is there any online facility to book various seva tickets. i have plan to perform archana. how many tickets are issued every day and at what time. any facility of advance booking. Yes, There are some sevas online bookings and room bookings available in meeseva Centeres in TS link Check at Meeseva centeres. I Want to know one thing can we do 108 pradakshinas??? is there place to do 108? Can anyone tell me about the details??? @Swetha, As per my knowledge there is no 108 Pradakshina in yadagirigutta like Chilukuru.. but here you can do Giri Pradakshina on early every Swathi Naksthra day. Please help me some one.. I want to do Giri Pradakshina.. it will take how much time and how far it is for Giri Pradakshina ? @Srilata Actually, Giri Pradakshina is celebrating on every Swathi Nakshtra day at early hours by the group of Devotees. it may take max 30 min. the devotees walk around the Yadadri Hill. some of Back side Hill route is not perfect, so go as per Authorites Guidelines. There is a proposal of TS Govt to make Giri Pradaksihna route with 6 Tracks, but its take time. Can you tell what is the total height of the temple from surface to top of the vimanam. Also can you explain the latest developments over there and surrounding please? @Kiran Unknown...Well your first two question about the hight etc., i have to check. about the latest developments you may follow facebook.com/yadagirigutta page where i am updating regularly almost daily basis. @manasa, there is a TS RTC bus for every 30 min from MGBS bus station. if you are coming on your own vehicle the route from kachiguda is Kachiguda - 6 No - Amberpet - Ramanthpur - Uppal - Ghatkesar - Bibinagar - Bhongir - Raigir - Yadagirigutta. As per info, you can purchase kalyanotsvam ticket in Telgnagna meeseva centers in advance and also available at temple. Is there a online process to book a room at yadagirigutta??? Is there any online process to book a room at yadagirigutta??? Kailash, Yes, you can book rooms in advance through Telangana Meeseva Centeres only also some seva bookings also available now. check with meeseva operator. please give me the information about swami vaari nithya kalyana seva,is the kalyana seva available in the month of september 2015 everyday ? so that i can plan to visit the temple. last time i have visited temple at the time of jayanthi so,at that time kalyana seva was not available. due to that i have not performed kalyanam during my last visit. You can book for Nityakalyanam, Suprabatha etc sevas and Room booking through any MEESEVA CENTERS only in Both states of Telangana and AP. as on day there no other online facility for the same. for your info. Hi, This is Vinay, Could you please let me know the booking timings for Satyanaratana Swamy Vratam and Maharaja Bhogam. (can we book on same day or a day before). Hi Vinay, just check the Home page of this site now, posted about all details of "Satyanarayana Vratham" (in lable see) and not aware of Maharaja Bogam will update soon, you can book same at temple premises. there is no online booking as on date. I want to go from gachobowli.Please help me How i will reach there ? @Anon, If you want to come from Gachibowli on your own vehicle, good route is take ORR towards ghatkesar, from there take Warangal Highway towards Warangal. its the best route. Can I come on weekdays too in order to avoid weekend rush? As I say in Secunderabad, So I think Jubilee Bus stand would be nearer one to catch business to Yadagirigutta. How many hour's journey from Hyderabad and can we return the very same day back? Please reply. @Sanjay, you can come any day, your idea also good to come on week days to avoid rush in weekend. every 30 min there is a AC/NonAC Buses available to Yadagirigutta from Jublee bus Stand. if you come early to yadagirigutta you can go back same day. Journey time from Uppal 1 Hour, based on traffic in Hyd it take 1.30 to 2 hours from Jublee Approx. Let me now the AC Buses are working on sunday's are not from Hyd to Gutta. Please give your feed back are give me Yadagirigutta Bus Station Contact number. @Praveen, as per my observations and available info every weekend (Saturday and Sunday) AC Buses available from MGBS (HYD) and JBS (Secbad) bus stations for every one hour. in other days from both stations 3 trips per day available. check for shedule timings with TSRTC CALL CENTER NO. 040-30102829 check with MGBS or JBS depo as the buses runs from that depos only. I wish to have darshan of the Lord at Yadugirigutta. I was told there are 5 Narasimha swamis in the cave temple. I wish to make a day visit from chennai. What time is suitable for a complete darshan and how do I arrange for darshan. I plan to reach Hyderabad in the morning and return to Hyderabad by evening. Thanks in advance. @Anonymous, Yes there are five forms of Narasimha Swamis in Cave Temple,Jwala, Yoganada, Gandabherunda, Ugra, and Lakshmi Narasimha Swamy. But Currently the Cave temple has closed for reconstruction work of Temple. you can darshan same at Bala Alayam (model temple) there. you may complete all your program in one day from Hyderabad if you visit on non-holiday day. @syeda Nazeen. in Holidays (satarday,sunday, and other holidays including) its goes average 6-25 thousands and in normal days average 3-5 thousands. its not official approx and observation only. Hi Unknow, you can get Buses from Secunderabad (JBS/Picket) for every 30 Min towards yadagirigutta and return from Yadagirigutta too, now a days AC Volvo Buses also running in this route, check in bus station for AC bus Timinings, before boarding. could you please share the informaton of kalyanakatta tmings for thala neelau. Im staying in Hitech City as I'm new to the city I request you to plese let me know how to reach the temple. Hi Jhani Garu, I am very happy to get this website, I am planning to perform Satyanarayana swamy vratam on this coming Sunday, please let me know the timings on sunday and latest status of the temple renovation, is the place of vratamandapam changed and can we stay over uphills, if yes is there any advance booking for accomodation at uphills? Hi, Venkatesh Gaaru, Sorry for late reply, as per my knowledge Satyanarayna Vratam you can perform at uphill, puja timings starts from morning 7.00 AM batch wise, the Vratha mandapam location changed. it is now under the Administration office of SLNSD. Since the renovation works going on Accommodation at uphill may not available as lots of buildings demolished for extension works. Do we have to purchase tickets online for special darshan? This is regular schedule of Darshan every day, only in special days it will be changed. Would like to that has the main temple been opened for devotees in which the swayambhu avatar is present? @ P Sreedhar, NO, at present Garbalayam is closed for devotees, but you can feel all as it is at Bala Alayam which constructed for temporary Darshans. Is the main temple or garbhalayam open now. @Vasu Krishnappa, No Still the re-construction of temple not completed, Darshan available in Bala Alayam only. Hii jhani garu.. We r planing to come on 26th Jan.. So can u please give the dharshanam timings for that day... Plzz.. And even surendrapuri timings..
#Jhani garu give i am from Tirupathi. I plan to visit Yadagirigutta at this year which month is the best for Quick darshan i mean rush. (November or December ). and what about accomodation if any online accomodation . Othar than week ends / Holidays you may come for darshan any day/month there is no problem, Usually on Holidays observing heavy rush... if you come in mansoon you may enjoy the surrounding greenery. 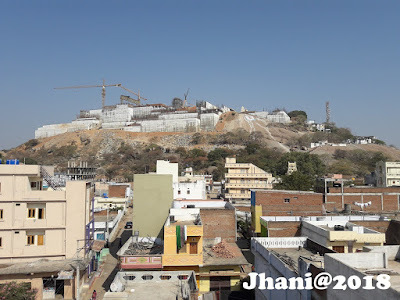 since all the buildings demolished for reconstruction, there is no temple accommodation rooms at uphill, but you may try Haritha Hotel booking online of Telangana Tourism. which is located uphill. A muslim brother. I am MVT,from uppal, but native of YGT. @MVT Actually no body is giving such information to the devotees, that's why i started this in 2007, we have to tell about our Native, cose we know very well about our Native than others. thanx for comment here. @Unknown i think you are asking for "Thala neelaalu" the timing for same is morning 5AM to night 8 PM in between 1 to 2 is lunch break ticket Rs.10/- only as per available info.